Incredible activity tracking, a days-long battery, and stylish, comfortable fit makes the Fitbit Ionic a fitness fan favorite. This product was featured in our Holiday Gift Guide! Check it out to find gift inspiration for everyone in your life. A mainstay in the fitness tracking industry for years, Fitbit’s ascension to the cream of the wearable crop was originally met with subpar competition. Today, companies like Garmin, Suunto, TomTom, and Samsung properly push Fitbit forward, preventing the company from resting on its existing innovations. 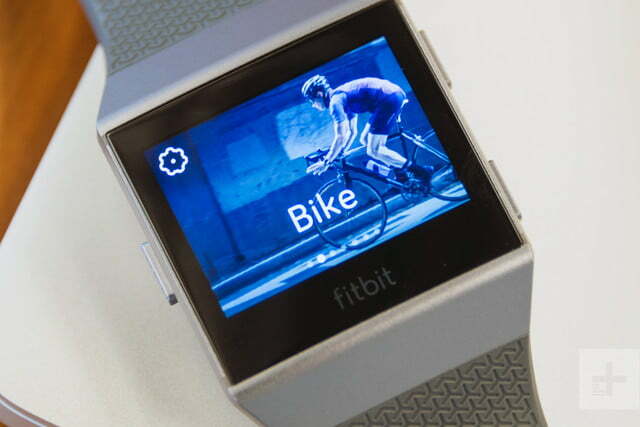 However, an unsurprising master class in wearables taught by none other than Apple — in the form of the Apple Watch — has Fitbit scrambling to maintain its position as king of the fitness hill. Its answer? The Fitbit Ionic. 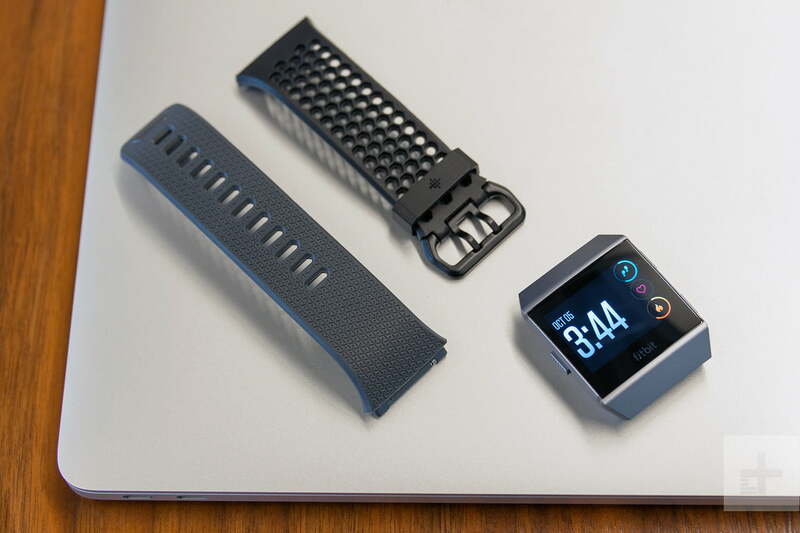 Our Fitbit Ionic review reveals a wearable that blends the impressive fitness tracking ecosystem of its two-year-old Blaze with a host of modern smartwatch capabilities such as a dedicated app store and NFC tap-to-pay transactions, along with Bluetooth and WiFi compatibility. 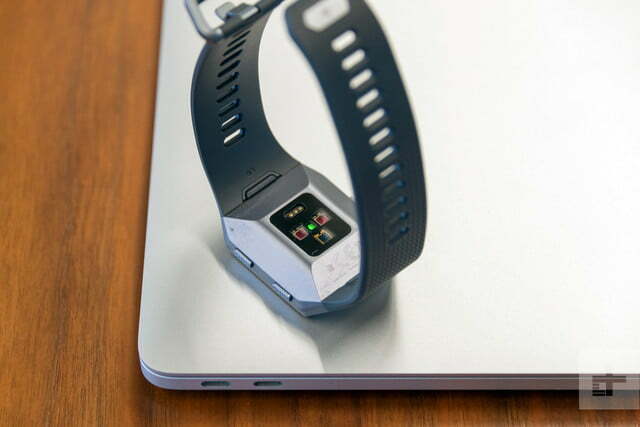 We put Fitbit’s Ionic through its paces to see if its updated software, customizable hardware, and overall performance give it the prowess it needs to stay relevant in an increasingly crowded market. Encased snugly in a package roughly the same size as a new iPhone 8 Plus‘, the Ionic arrives with everything needed right out of the box, including a small and large standard watch band, the Ionic smartwatch face, a charging cable, and a small pouch for carrying said charging cable. The box also contains a few manuals explaining how to activate the watch and how to use it. Thankfully, the Ionic arrived with a bit of a charge, so all we had to do to get underway was pair it with our smartphone via Bluetooth. 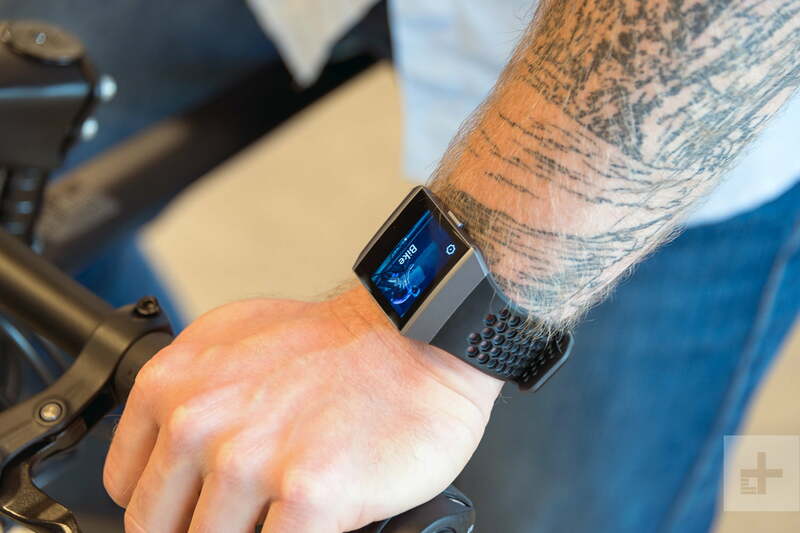 Having spent many months with Fitbit’s Blaze, strapping on the Ionic was a familiar experience — despite the fact Fitbit developed an entirely new operating system dubbed Fitbit OS. However, using the Ionic’s interface is much smoother and cleaner than any previous Fitbit model, which immediately stood out during our first few minutes wearing it. Navigating the home screen — to see daily steps, heart rate, and calories burned — requires nothing more than a simple tap on the watch face to cycle through each set of data. As is the case with many wearables, the Ionic’s screen is set to wake up whenever its wearer lifts a wrist. If for some reason the watch doesn’t wake up automatically, a small button to the left of the screen unlocks (and locks) the watch face. From here, the OS grants quick-hit access to daily fitness statistics, a selection of workouts, or to the updated allotment of available apps and services. From a comfort perspective, the Ionic’s included watch band is constructed of the same type of elastomer found in several other fitness bands and smartwatches, allowing it to avoid feeling like an obtrusive accessory. Even when we worked up a proper sweat — be it from running, hiking, or otherwise working out — the Ionic never felt uncomfortable on our wrist or impeded our activity. Even with its larger watch face, it never got in the way of whatever exercise we were trying to accomplish. Headlining Fitbit’s foray into the world of apps is a strong three-headed monster in Pandora, Strava, and Starbucks. Pandora is self-explanatory, Strava is essentially a social network for runners and bikers and the Starbucks app lets you upload gift cards for use as payment in its cafes. Using Pandora on the Ionic features a particularly high hurdle for use: A Plus or Premium membership. Sure, it’s not an entirely walled-off barrier to entry, but there’s no denying the tens of millions of people who already shell out $10 per month for either Spotify or Apple Music, especially considering Pandora offers a free version of its application. However, this nitpick becomes a touch less serious when you factor in its ability to not only control music via a paired smartphone but also its capacity to store roughly 300 songs — for use without a companion phone. Still, having the ability to use Pandora’s fee-free app would be a welcome feature. Outside of the big three, Fitbit’s App Gallery provides users with a well of compatible apps like Amazon Alexa, MyFitnessPal (powered by Under Armour), and Weight Watchers, among many others. On paper, these certainly expand the realm of possibility for the Ionic, but as of now, the number of available apps leaves a bit to be desired. Though it’s not something capable of drowning the watch, with competition like the app-rich Apple Watch, it’s not unfair to want more here. Considering the Ionic is a first-generation smartwatch for Fitbit, it’s reasonable to expect its app offerings to become more comprehensive down the line. Fitbit’s attempt at entering the full-feature smartwatch industry is valiant — no doubt — but where the Ionic truly shines is with its fitness tracking, an aspect of the company’s wearables that’s always scored highly. As expected, the Ionic tracks a wearer’s daily steps, heart rate, burned calories, sleep patterns, and flights of stairs climbed. In addition to this tracking data, the Ionic also offers personalized exercise routines, the ability to track swim workouts, guided breathing sessions, sleep tracking, and sends friendly, hourly reminders to keep moving. We especially liked the auto-detecting feature. Like the Blaze before it, these features shine on the Ionic, allowing users to view a wide range of data related not just to levels of fitness but also sleep habits. Concerning the sleep-tracking aspect, it’s an interesting experience having the ability to view charted data pertaining to a night’s sleep. For instance, after a night where we felt as though we woke up sparingly, the companion Fitbit app revealed a different side to the story as it showed several colored blips indicating wake ups throughout the night. During our time with the watch, we especially liked the auto-detecting feature that would automatically start tracking a run a few minutes after we started. Without requiring the need to manually select a workout, this allowed us to literally lace up our runners and immediately get going on a run without missing out on tracking our valuable running data. 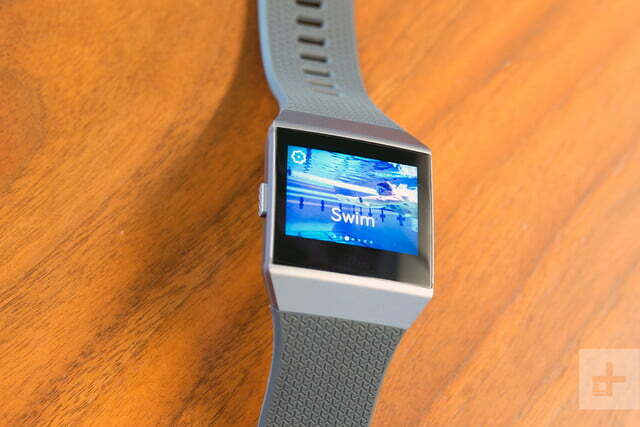 Perhaps one of the Ionic’s best new features is the fact it’s water resistant up to 50 meters. This means it boasts the ability to track swim workouts, including keeping track of the number of laps, swim duration, and amount of calories burned. Oh, and in case you’re wondering, the Ionic knows when you’re swimming, too, so no need to start that activity tracking manually. Of course, simply wearing the Ionic won’t improve your sleep patterns, cardio levels, or desire to workout but there’s no denying that its constant tracking and accessible data create a game capable of continuously pushing you. This is especially true when you factor in the ability to connect (and compete) with other Fitbit-wearing friends via the companion Fitbit app. Few things accomplish the goal of making working out fun, which makes an intuitive and engaging wearable like the Ionic even more attractive. 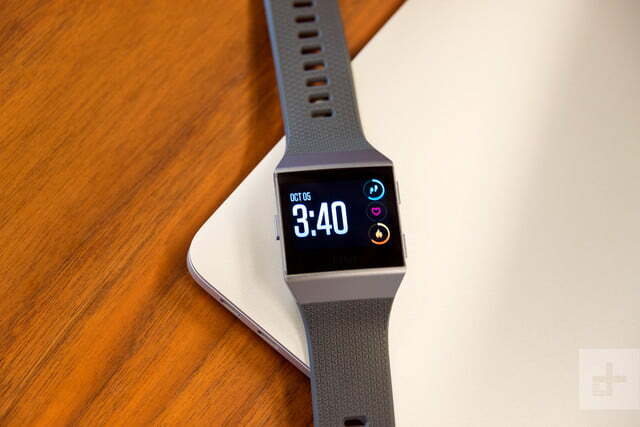 Like many fitness trackers, Fitbit allows Ionic owners to customize the watch to fit their lifestyle. Be it simply picking one of three base colorways or outfitting it with a leather, sport, or classic band, the available options add to the watch’s versatility. We enjoyed the subtle style of the classic watch band and were especially fond of the sport option which features a comfortable, breathable band. While we scored Fitbit’s Blaze highly, we found its stock band to cause irritation issues after only a few weeks of use — even with us washing the band after wearing it during a particularly sweaty workout. 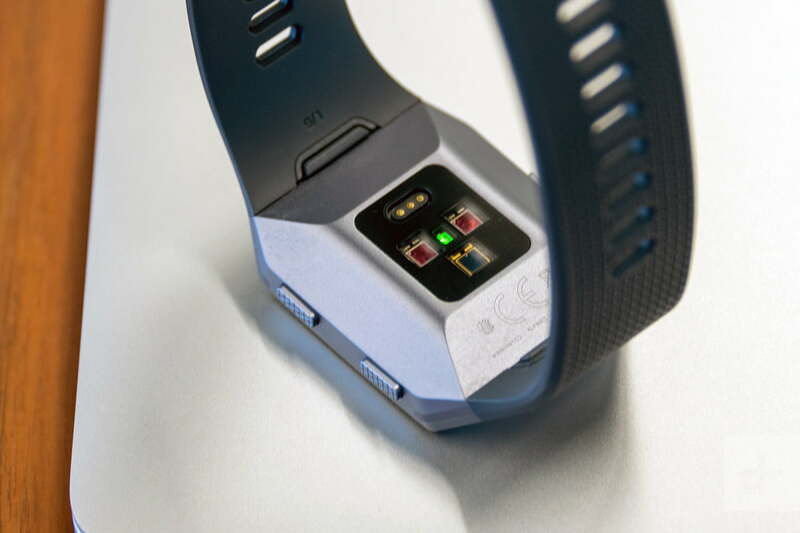 With the Ionic’s sport band, however, this problem was solved, as its breathable design allowed our wrist to avoid sitting in hours-old sweat. In other words, this add-on band is well worth the extra $30. The bane of any smartwatch’s existence, the Ionic’s battery life is remarkable. On a single two-hour charge, we were able to go several days before needing to plug it back in. Fitbit claims the watch is capable of lasting four or more days on a single charge and roughly 10 hours of GPS time; estimates we found to be roughly correct. While it’s not a complete dealbreaker to need to charge a smartwatch every night, having the ability to do it every few days was a welcome feature. For Fitbit, a longer battery life is especially important so its users have the ability to utilize its sleep tracking ability instead of needing to dock it at night or charge during active daytime hours. Fitbit offers Ionic buyers an initial 45-day money-back guarantee, along with a one-year limited warranty which covers manufacturer defects. As it enters the smartwatch market for the first time, Fitbit’s Ionic is an impressive debut. 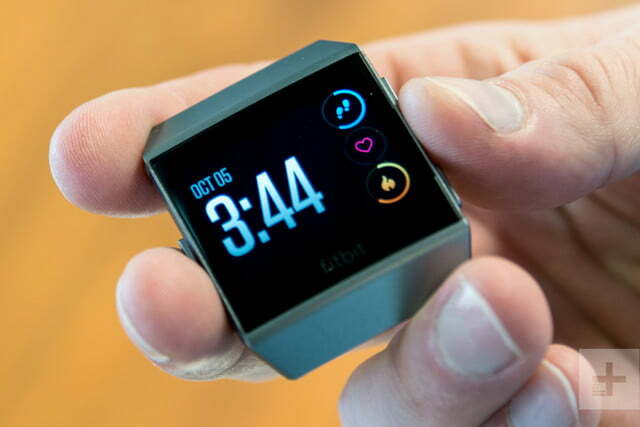 Despite it lacking the ability to respond to text messages and emails or a comprehensive app store, the fact that it’s a first-generation smartwatch for Fitbit should mean there can only be positive improvement moving forward. For a watch that already gets a lot right — incredible fitness tracking, a days-long battery, and stylish and comfortable alternate bands — the future appears bright for the Ionic. Anymore, the smartwatch industry is led and dominated by Apple. Having just announced its latest iteration — the Apple Watch 3 — there’s no doubt this is Fitbit’s largest competitor and, arguably, a more full-featured alternative. At a price of around $30 more than the Ionic, the Apple Watch 3 offers users a wide range of compatible applications and a higher level of interaction. To Fitbit’s credit, the Ionic may be the king of actual fitness tracking — which isn’t terribly surprising — which makes it a supremely attractive option to those who stay consistently active. Though we’ve only spent roughly two weeks with the Ionic, there doesn’t appear to be any sort of significant wear and tear capable of rendering it useless. Perhaps the biggest threat to its longevity concerns the market itself. Every year a new smartwatch debuts, be it an updated version of a past release or an entirely new variety, smartwatch companies stay busy planning their next releases. 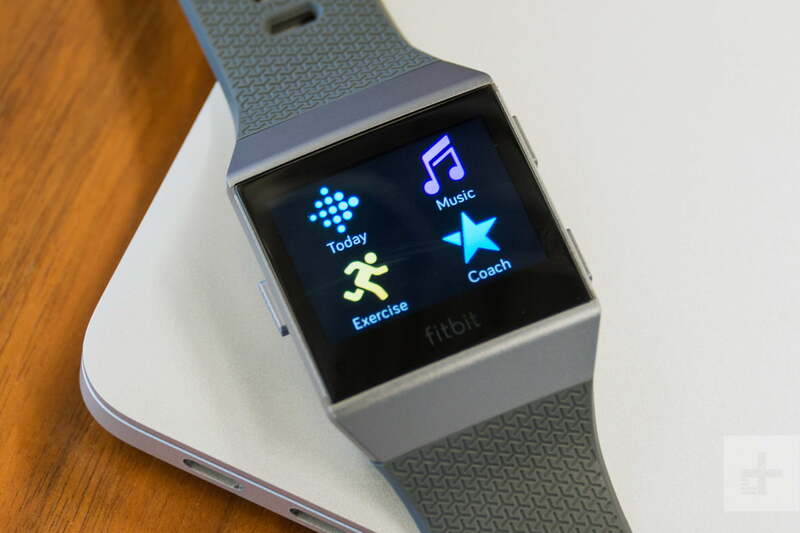 The hope with the Ionic is that instead of releasing its successor, Fitbit will instead work toward upgrading and enhancing it to improve the experience for current and new owners. Fitness fanatics should absolutely buy Fitbit’s Ionic. Featuring an impressive suite of fitness tracking capabilities — such as auto-tracking of runs, swim tracking via its waterproof design, custom workouts, and multi-sport compatibility — there’s no better way to stay connected to your fitness profile. Pair this triumph of tracking with an easy-to-use companion app and it’s hard not to love Fitbit’s extensive ecosystem that accomplishes the rare goal of making working out fun. For smartwatch enthusiasts looking for a full-featured option, the Ionic (in its current state) may leave you wanting more. Lacking the ability to respond to text messages and emails or a comprehensive app store has it coming up just short of the Apple Watch. The Apple Watch is around $30 more expensive than the Ionic, but offers more for that price — not exactly surprising considering its Apple’s third-generation smartwatch.